Chalet Runca is large Meissen Style house full of charm, space and privacy. There is a relaxation area on the ground floor with steam room, sauna and walk in power shower. Two bedrooms, each with en suite shower rooms, also occupy the ground floor. The first floor is the main communal area with dining room, sunny high ceiling living room complete with fireplace, large balcony offering stunning mountain views, TV room, toilet/shower room and kitchen. The top floor offers a family room with its own bathroom and two bedrooms suiting another family sharing a shower room. The lower ground floor accesses the garage and ski room, which opens onto the free ski bus stop twenty metres from the property. It offers Traditional appeal together with modern comforts: - double glazing, underfloor heating, wireless internet , ipod docking stations, & surround sound multimedia screen, a large selection of DVD's, games and books. A popular venue with groups and three generations of Family, who receive a warm welcome from the hosting owners. Living year round in Arosa, with Ski Instructor husband and two children. Located on a peaceful residential road, only minutes walk from the lively town amenities and sporting facilities. There is the added convenience of being on the bus circuit, taking you door to door to the lifts, and also to the toboggan runs and train station. Spacious with stunning views in sunny location, beautifully constructed, iced spring water comes directly from the taps, well equipped with modern comforts - underfloor heating, power showers, sauna, steam room, walk in shower, wifi, oven gas hobs, microwave, dishwasher, large public floor - dining area, two living rooms, balcony with seating, kitchen with seating for eight around a fitted octagonal table & stone floors. Guests often comment on how comfortable the beds are. Same day wash, dry, fold service - not for guest use. Two adjoining living rooms - one large, one small for kids wii/dvd viewing. Guests have sole occupancy of the kitchen, which opens out onto dining area and living room. It is well equipped with sharp knives, radio, internet access. The beautiful mountain resort of Arosa is located at an elevation of 1800 meters at the end of the Schanfigg valley in canton Graubunden in Switzerland. The highlight of the resort is a breathtaking alpine panorama, surrounded by an unbroken ring of mountains 2,500 to 3,000 meters high. Boasting 1800 hours of sunshine every year, Arosa offers 225 km of groomed trails for all levels of skiiers connecting to the neighbouring Lenzerheide ski area. Free buses run all winter long. The wonderful diversity of nature is complemented by a nice variety of sporting, leisure and cultural amenities. There is something for everyone in the family - skiing and sledding, hiking, lakeside walks, relaxation, nightlife, fun, shopping. Arosa's advertising slogan rings true: 'Warning: Arosa can be addictive!'. Our luxury chalet is in the center of three lakes in Resort, about 300 meters from the main cable car Weisshorn and the Tschuggen chair lift. It features a large open concept gourmet kitchen, dining and living room with full length windows running the entire length, large balcony and mountain views. Five good size bedrooms for a large family or for 2/3 families holidaying together with 5 full bathrooms, round out the 350 square meter living space. Large flat screen TV with DVD player and internet access. There is a large library of books, games and movies for your enjoyment. Parking space is included in the covered garage. Chalet Runca is close to all the amenities, restaurants, bars, shopping, ice-skating, tobogganing and other sport activities. When the streets are snow covered, you can even ski back directly! 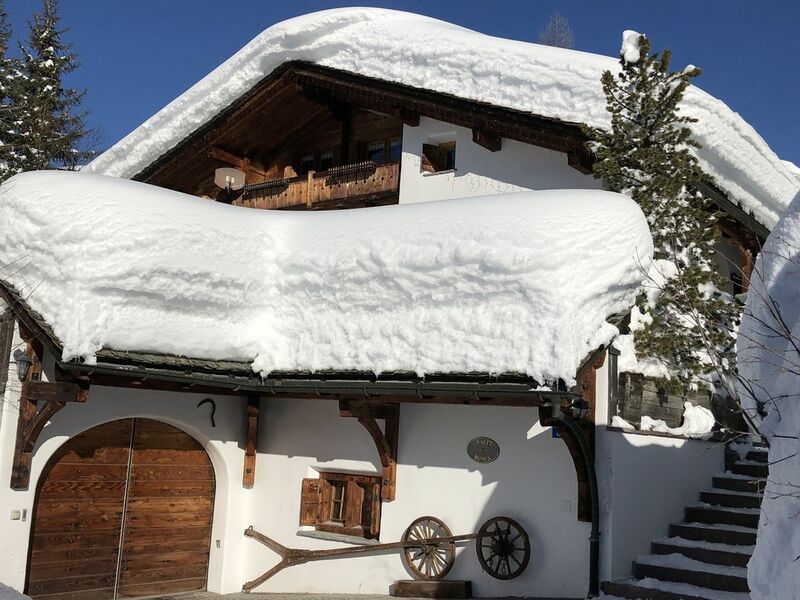 We look forward to welcoming you to Chalet Runca this winter.